Ever wanted to know what it’s like to play one of the ultimate roles in a musical? Ever wanted to know what it’s like to be painted green every night, before performing those amazing songs to a packed out audience, night, after night? Well, look no further. Our second part special, featuring the women who get to play Elphaba, in the UK touring cast of Wicked! Not only did we chat to the woman who gets to play her every night – Ashleigh Gray, we also got to ask similar questions to stand-in Elphaba – Jacqueline Hughes, to compare how both women feel about the role and to find out what their experiences of playing Elphaba in the UK touring cast of Wicked! Here is our second part interview, in our exclusive set of interviews with a select few of the UK touring cast of Wicked! Stay tuned for part three, which will coming up soon! Ashleigh Gray – interview. Part I of II, as we quiz her about playing Elphaba! What were your expectations before the tour began? Luckily, I had worked in the show in the West End for three years so I knew exactly what to expect, a fantastic show that wows audiences. I was very excited to be able to take the show around the country! How do you think you have developed in to the role, since the beginning, when you first started out with the cast? It’s been a really learning curve getting to play this role eight shows a week. Constantly finding new things about her and bringing them into the performance has been lovely. The tour has covered parts of Scotland, including Edinburgh and Aberdeen. As you come from Fife, did it have a special meaning to you, to perform in those venues? It really did! It’s not often my family get to see me perform as have worked mainly down in London, so to have all my old friends and family in watching was really special. Plus, I had never worked at the Edinburgh Playhouse before, so that was really something I looked forward to, enjoyed and will remember fondly. What was the first show that you ever saw live? Oh, I really can’t remember. It was probably something at the Brunton Halls, my local theatre back home. I was lucky that both my parents and grandparents would take me to things like that. It was really the old Musical Films that made me catch the bug. 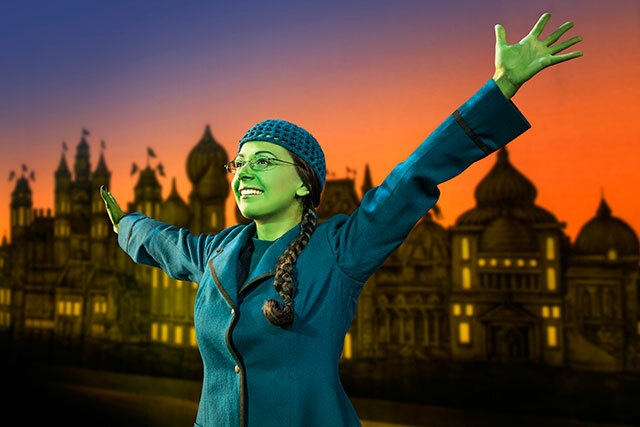 Can you remember where you were, when you were told that you had won the part of Elphaba? Yes, exactly. I’d just got off the bus and was in the Co-op buying Broccoli! Very glamorous! Elphaba has a few nicknames – any favourites? Probably Elphie, even though it is a little perky. What’s the best thing about performing in Wicked? The audience reaction. This show, more than any other I’ve done really reaches out and touches the people who come to see it. It’s great to see people enjoying themselves and not a show goes by when they don’t raise to their feet to show just how much they’ve loved it! It’s a very special show to be part of. Tell us about the process of getting painted green every day and how long does the green paint take to get off? It certainly takes a bit longer to come off than it does to go on! I’m always left with remnants of the green in the most awkward places at the end of the night. The greening up takes about 25/30 minutes. Thankfully I have a wonderful make-up artist who takes care of it for me, so I can just sit back and relax and let the transformation take place. The tour is now coming to an end (sob), in Salford. What will you miss the most about it? My wonderful Wicked family. I’ve had such a great time with a truly terrific group of people on this job. When you tour, the cast/crew/company become your friends and family as you spend so much time with them. I’ll miss seeing those gorgeous faces every day. And of course, I’ll miss Elphaba! She’s been an absolute joy to play and will always have a special place in my heart. Who are you the closest to in the cast? Naturally, I have a very special bond with Emily, my Glinda. I can’t imagine playing opposite someone in these two roles who you didn’t get on with. I’m so lucky to have had her there with me every step of this journey. We get each other through. 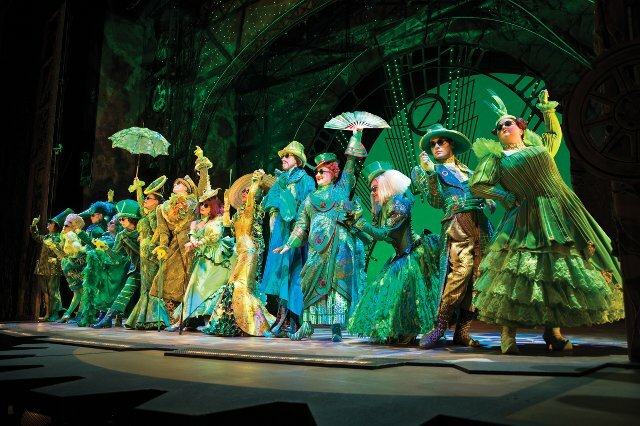 Do you have a favourite scene or song from Wicked to perform? I really enjoy the Dorm scene. It’s always amusing to see what Emily is going to bring to the stage each night. And of course, there really is no better Act 1 Finale in Musical Theatre, than Defying Gravity. It’s always a pleasure to perform. Tell everyone why they should come to see the show in Salford? If you want a night full of wonderful songs, a great story and fantastic visuals as well as a little bit of magic – then Wicked is for you! Come see us before I get on that broomstick and fly out of the Lowry! What’s next for you, after the tour finishes? Definitely a bit of a rest, I think and possibly a holiday. After that, who knows? That’s the joy of being an actress. Jacqueline Hughes – interview. Part II of II, as we quiz her about playing the role of stand-in Elphaba! Having been in the London Production I already had a head start in knowing what to expect – I knew it was going to lots of hard work but equally lots of fun! I had to prepare to be on at any time and just trust that I knew what I was doing. Coming into a new company straight from London was tough as I only knew Sam – having worked with each other. But everyone was so welcoming and it soon felt like home. With that my confidence grew, and I started to explore the character of Elphaba more with every opportunity. She is such a complex character and I am still finding out new things about her now. The tour has covered parts of Scotland, including Edinburgh and Aberdeen. As you come from East Kilbride, did it have a special meaning to you, to perform in those venues? Absolutely. I grew up going to watch shows at the playhouse, so having the opportunity to play Elphaba with all my family and friends in the audience, it really was something special! Can you remember where you were, when you were told that you had won the part as the Standby Elphaba? Yes, I was on a break from rehearsals at the Apollo Victoria, so Hannah Toy (Wicked Dance supervisor) and I had popped out for a coffee. She is one of my closest friends so it was so wonderful that I got to share that moment with her. There were lots of tears, I felt like the luckiest girl in the world. Oh goodness, everything! Getting the chance to go on the wonderful journey and tell Elphaba’s story is such a dream, and of course not forgetting those iconic songs. We have an incredible wig and make up department who assist with the process, it takes about 20-30 minutes using lots of green paint and then it takes me about 20-30 minutes to get it off as it really likes to get stuck in my hair. I’ll miss all the wonderful people I’ve met and worked with over the last year! That’s what makes the job, we have been just one big family. The joy of being stand by to Elphaba is that I get to spend so much time with people both on and offstage, so I’ve built up some lovely friendships over the past year. I absolutely love No Good Deed – I can really get my teeth into it, for me that’s the peak of the show! Being at home and playing the part of wife. Oh, and infinite cuddles with my dog, Coco. Pretty Little Liars: Who are A / Charles and Red Coat?